As technology advances, so do the methods we use to share information both inside and outside of our organizations. There is a lot of buzz around file collaboration these days and with good reason. As employees become increasingly dependent on being able to share and collaborate on large files, companies are discovering the advantages of providing the tools that make file sharing easy and secure to stay compliant with privacy laws and company policies. GoAnywhere MFT offers a variety of options designed to make the most of your file collaboration needs. From sending a large ad-hoc attachment as an email link, to allowing back and forth collaboration, revision tracking and commenting, GoAnywhere MFT helps your employees stay productive while reducing strain on your IT department. As many businesses restrict employee use of cloud-based file sharing services, finding an easy-to-use alternative for file sync and sharing has become paramount. 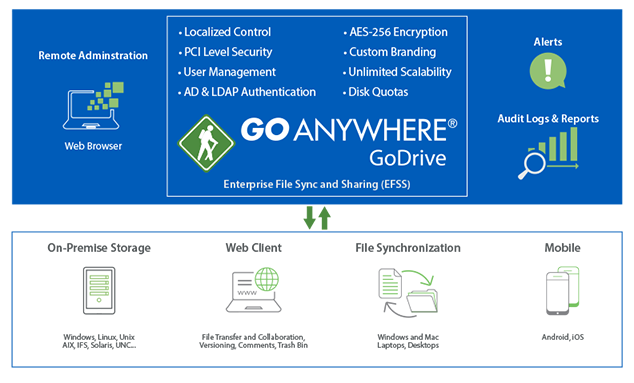 GoDrive by GoAnywhere is an Enterprise File Sync and Sharing (EFSS) solution for your employees and trading partners. Advanced collaboration features including revision tracking, commenting, trash bin, media viewing and user controls are all included in an affordable easy-to-use system. "Your support team does an excellent job! You are very attentive to your customers and that means a lot! I would definitely recommend your product to anyone, not just because it is a great product but also because you can count on having the support when you need it." Need to send ad-hoc messages with large files or sensitive data? As simple as sending an email, Secure Mail by GoAnywhere can help you securely send messages and attachments without file size restrictions from your network. Make it easy for your employees, customers and trading partners to perform secure ad-hoc file transfers and collaboration. Through an intuitive browser-based dashboard, your users can quickly upload, download and share files with full audit trails. When you are on-the-go, it's important to have access to important files no matter where you are. Secure Folders by GoAnywhere allows you to define folders on your network that can be accessed virtually anywhere by authorized web users with a browser and internet connection. Granular controls allow you to specify user permissions while detailed audit trails and reporting helps you maintain compliance. Some say the best things in life are FREE. GoAnywhere MFT gives you 10 FREE GoDrive user accounts. It's perfect for small companies and groups who need to collaborate and share files, but need a high level of security and local control. Get a FREE Enterprise File Sync and Sharing solution with GoAnywhere MFT today.